Mainstream support: Ended on October 12, 2010. Extended support: Ended on October 13, 2015. A new version of Office was bundled called "Microsoft Office Mobile" which includes PowerPoint Mobile, Excel Mobile with graphing capability and Word Mobile with the ability to insert tables and graphics. Media management and playback was enhanced with Picture and Video package, which converged the management of videos and pictures and Windows Media Player 10 Mobile. Among new hardware features were enhanced Bluetooth support, default QWERTY keyboard-support and a management interface for Global Positioning System (GPS). 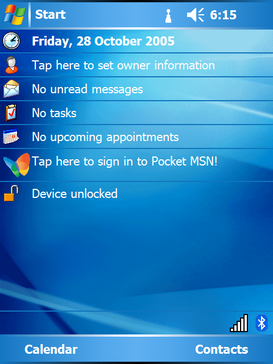 Improvements were made to ActiveSync 4.2 with 15% increased synchronization speed. Business customers benefited from a new error reporting facility similar to that present in desktop and server Windows systems. Caller ID now supports photos so a user can apply an image to each contact to show when a call is received. DirectShow was also natively added. This release was the first to include DirectDraw with hardware acceleration, replacing the deprecated graphics component of GAPI, and Pocket MSN can be viewed directly from the Today Screen. Windows Mobile 5.0 requires at least 64MB of RAM, and the device must run an ARM compatible processor such as the Intel XScale or the Samsung and Texas Instruments ARM compatibles Windows Mobile until May 8, 2005 (2005-05-08). ^ a b "Microsoft Support Lifecycle". Support. Microsoft. Retrieved 12 January 2016. ^ De Herrera, Chris. Windows CE/Windows Mobile Versions. pocketpcfaq.com. Retrieved September 6, 2007. This page was last edited on 13 September 2017, at 21:38 (UTC).